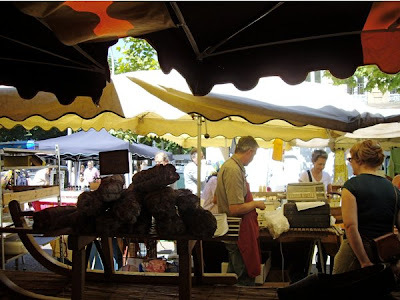 Every French city with respect for itself, has a food market. So also in Strasbourg. As we walked up the streets not far from Council of Europe, we ran into an impressive market at Boulevard de la Marne. The market was located in the middle of the large street. It is open every Tuesday and Friday. Food markets bring consumer and local producer together, cutting the middlemen thus giving both the producers and consumers better products at a better price. I was pleased to see the wide range of products available. 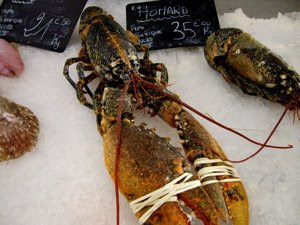 What about these delicious lobster brought all the way from the North Sea, under offer for €35 per kilo? A good price for such a delicacy. 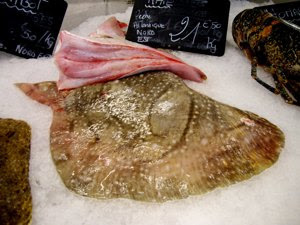 Here in Norway you easily pay €50 per kilo, and for such a beauty you may have to pay around €70 at Boulevard de la Marne. What to make from it. Delicious just to boil, served warm with melted butter, or cold mixed with mayonnaise. 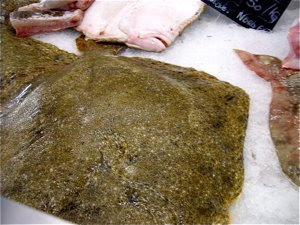 The turbot is a flatfish, related with halibut, plaice and sole, but are served in a completely different way than the smaller ones. I have not prepared turbot. I have however prepared its close cousin the halibut in different ways. I have marinated halibut in pesto and rolled it in bacon, or steamed in a delicious fish parcel with salmon and scallops. I have never prepared skate wings, and have seen it prepared on BBC Food once. The famous cook Rick Stein prepared it with a sauce made from vinegar and melted butter. Well here it is, and if you want to prepare skate wings, do some research, try a recipe and let me know how it tasted. Say cheese - you are in France, after all!! France is a cheese producing country and the French loves their great number of different cheeses, from the soft cream cheese, like the Saint-Marcellin I enjoyed at Le Gourmand de Saint Jean in Lyon, delicious blue cheeses as the Roquefort, and the Comté a hard cheese resembling the Swiss Gruyère and Emmenthal cheeses. I think it is this variety that is for sale here, at €29,90 per kilo. My nephew Hans Torsvik Ørnes gave me Reypenaer VSOP 2 Years a year ago, bought on duty-free at Schiphol airport, on his way back from Japan. 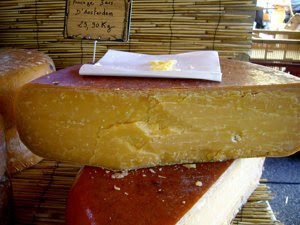 It had the same hard consistency as a Parmesan, a nutty taste, but through it it was definitely a Dutch Gouda. 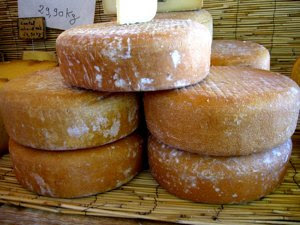 Like this one, a cheese originating from Amsterdam, aged even longer than the Reypenaer, for three years. Red alert – freak weather on your destination!